Hwy 129 heads south out of Lewiston, ID/Clarkston, WA. If you are not familiar with the area, Google a detailed map to find your best route to avoid traffic depending on the direction you are coming from. At Asotin follow the signs and turn right after passing the gas-n-go. The road will start to climb up very quickly and from here just stay on the main paved road all the way to Enterprise, OR, about 87 miles. To find Wallowa Lake, Turn Left onto Hwy 82 and head toward Joseph for 6 miles. In Joseph go all the way up the main street past all the shops and the road turns left to head out to the lake, the park and Lodge are about 6 miles at the far end of the lake. (Note: taking the return trip, Hwy 3 at Enterprise is not marked from the east end - it is the wider street that heads north with a stop sign and kiddy corner to the older gas station. 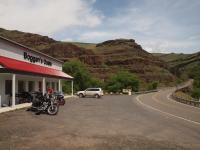 Continuing west on hwy 82 will take you to La Grand, OR, or Walla Walla, WA, both are great rides. Special direction notes: From Joseph you can head east on the Imnaha Hwy, turn right onto Wallowa Mt Rd-FS39, to take you through the mountains to Hells Canyon and Oxbow. (This is a national scenic byway, but do call a head to the forest service to check road conditions as it changes every year and is closed in winter.) Take a left on Hwy 86 to Oxbow and you can link with another ID road on this site or take hwy 71 to Cambridge, ID and Hwy 95. The scenery on this road is amazing. You'll follow along the Snake River out to Asotin, then twist and climb up to the top of the Butte. To the southeast you will have some views of the cliffs of the north end of Hells Canyon Then the scenery changes from grasslands to wooded forest and you'll soon see the sign Rattlesnake Pass. Through the trees you start to get a glimpse of the grassy canyon you'll be descending; there are many view points along the way. Be sure to stop at Joseph Canyon Overlook for an amazing view of the historic Nez Pierce winter homelands and far off to the south the high peaks of the Wallowa Mts. (Blue Mts. of Oregon). The hwy continues south through the woodlands for about 25 miles and rounding a sharp right corner you'll get a majestic view of Eagles Cap peak and the Wallowa range. In May the grasslands are very green and the mountains are still covered in snow making for some amazing contrast. Wallowa Lake is quite spectacular especially in the early morning sun. "Teak" added this in Jan of 2015: "Along this highway you will crest many times for spectacular views of north east Oregon, then drops repeatedly to ride along the river, excellent for a dip during hot weather. The Grande Ronde River. South of Enterprise is a dirt road, Crow Creek Road, that takes to a ledge looking down to the Snake River's Hells Canyon. I would take camping gear and overnight on the ledge." "Teak" added this in Jan of 2015: "The highway is very good pavement, curves and drops, map is deceiving when it shows a straight road way. the dirt road to Hell's canyon is graded, no ruts. Hellufaride." Not many amenities along this road and NO gas from Asotin to Enterprise so fill up before you leave - Note gas was 40 cents a gallon more in Enterprise, OR than in Lewiston, ID. Grogan's Oasis has cold drinks, food and souvenirs. Fields Springs State park is just past Anatone; camping is available. At Wallowa Lake there is Wallowa State park with camping, fishing and other activities and the Wallowa Lake Lodge that has a 4 star restaurant and excellent prime rib on Friday and Saturday nights. There is a tramway that takes you up the mountains in the summer months. Joseph is a fun little tourist town with lots of shops, inns, bars and good places to eat. "Teak" added this in Jan of 2015: "No amenities, gas and food are at Enterprise, a small farming town, if you want the tourist town, Joseph is a little bit farther. Definite tourist town, lots of brass sculptures, trinket stores and restaurants. Groceries and gas in Enterprise." on April 2, 2014 1 out of 1 members found this review useful. Turn at Elgin and head over Tollgate to Walla Walla,back on 12 to Clarkson for a complete loop. My friend and I camped in Lewiston, rode the rattlesnake and above route and camped in Clarkson that night. 326 miles between campgrounds that are only a couple mile apart. on June 19, 2012 1 out of 1 members found this review useful. We took this road from Lewiston on out way to Baker City. It's fantastic. Coming from the flat land the twisties here are so much fun. on April 8, 2012 1 out of 1 members found this review useful. We stumbled on to this road by accident in 2010. Great scenery, especially on the OR side. Lots of switchbacks and twisties. When you get to Enterprise be sure to stop at Heavenly's for a burger. on February 29, 2012 1 out of 1 members found this review useful. I'm not the world's most experienced rider but I've been on some pretty twisty roads and the stretch through Rattlesnake is wild! It's the sort of ride sport bikes are built for. I stumbled upon Rattlesnake by accident back in 2010 on my way from LaGrande to Lewiston. I just happened to come across a group of Corvette owners and got to have some fun with one of them playing follow the leader through the canyon. The road stays pretty fun all the way to Clarkson, too. I can't wait for the weather to improve so I can head that way again. on November 19, 2011 1 out of 1 members found this review useful. In Enterprise you are surrounded by the stunning snow covered rocky peaks of the Wallow National Forest, with the Eagle cap wilderness just beyond. Route meanders through high mountain farm land. As you approach the Washington, Oregon, Idaho boarder you have views in deep river gorges green with grasses and teaming with wild life especially mountain goats. The tight curves start as you wind down into the rocky Grande Ronde river valley. Once you climb back out or the valley your back into rolling pature lands. At the end the route winds back down into the Snaker river area. The road quality along the entire route is very good, not many potholes or road snake. The best part of the ride is the desenct and assent of the Grand Ronde River valley, dozens upon dozens of tight curves hugging very steep walls of the valley. Stay on your toes here because there is usualy gravel/fallen rocks on the inside corners closest to the cliff walls. Know your lean angle limits because you will push them to the limits. The rest of the route has nice sweeping curves with little traffic. Get gas before you leave Enterprise or Asotin none along the entire route. There is a in the middle of the route at the bottom of the Grande Ronde river valley to stop for cold drinks. Boggans Oasis. There are very large elevation changes between Enterprise and Asotin be prepared for drastic temperature changes. Even if its 80 and sunny in Asotin take a coat because the pass near Enterprise could be 50 degrees. The trip leading up to Rattlesnake Grade does not prepare you for the ride or the scenery you are about to encounter,but once it starts, all you can say is WOW! on December 14, 2017 0 out of 0 members found this review useful. up date on Route: a flood changed the topography of the canyon north of Boggans Oasis. The road has been repaired. Also Boggans restaurant burned down. http://www.boggans.com. So be sure to bring water/drinks/snacks. There is a restroom at the Joseph Overlook about 5 miles from the south end of the Rattle Snake Grade. Still one of my favorite local rides. on September 24, 2015 0 out of 0 members found this review useful. One of the best that Oregon and Idaho offers. Lots of scenery, lots of twisties and lots elevation changes (I think you go from about 1200 ft to 7000 feet and back down at least 3 times). It's like a giant roller coaster. The posted pictures are spot on. Would do it again if in the area. on January 5, 2012 0 out of 1 members found this review useful. I live at the start of this ride; Asotin, WA. I ride often down Rattlesnake to Bogans Oasis Restraunt, not Grogains! The milk shakes and burgers alone are worth the ride. The ride is one of my favorites. The third weekend in August is Bronze Bike in Joseph, Oregon, a great excuse to ride and camp! The same weekend at Starkey, Oregon near LaGrande, Oregon is the annual Victory motorcycle get together weekend. More beautiful riding from Wallaw, Oregon to LaGrande, Oregon. Twists and turns through the mountains down to the river and then twists and turns back up the mountains and into the forest of Oregon. on March 13, 2011 0 out of 1 members found this review useful. I've heard of this trip many times over the past few years and I am finally gonna get to give it a run. Been up and down the old spiral highway lots. LOVE IT! June 9th 2011 I and my brother will be doing the snake. I will give my review then! on March 9, 2011 0 out of 0 members found this review useful. I convinced a few guys to take this last year, and we all fell in love with it. I suspect we'll take it again this year. Fantastic ride!! on October 6, 2010 0 out of 0 members found this review useful. This is one of my favorite rides, and I've done it in all sorts of weather. Others have mentioned the gravel as a hazard, but I have to emphasize that there are often rocks which have slid off the hillsides on Rattlesnake Grade, of all sizes. Stay on your toes on this one! Took this road on a trip to McCall ID starting in Spokane WA. There is a road closure which had us divert through Baker City. Great ride between Baker City and McCall! This road is awesome scenery and nice turns the only reason I don't give it higher marks is the gravel and slightly poor pavement condition which slows the speeds. On the way down hit the old Lewiston Grade road you won't be sorry, two of the best roads you can hit in the same day. on September 15, 2010 0 out of 0 members found this review useful. it is a great ride, but you have it listed is washington. on July 3, 2010 0 out of 0 members found this review useful. Oh its a wonderful ride I try and do atleast once a year. And makes a nice loop from Pendleton to Clarkston over the grade and back through the Wallowa valley and over the Blues. And great mid week not that much traffic. My friends and I did this ride a few years back and it's nothing short of spectacular. If you're in southeast Washington it's worth your time to add this ride to your trip. on January 27, 2010 0 out of 0 members found this review useful. One of the best rides in Washington. A must ride ! Watch for the gravel in the corners. I rode this section of highway back in July 2007 heading north from Enterprise, OR to Clarkston, WA. It is a wonderful stretch of highway with dramatic scenery, fast sweepers, and big elevation changes. The Rattlesnake Grade was particularly memorable... wide expanses of huge, barely forested hills and one twisty road down & out. You'll not want to stop for pictures but you'll regret it if you don't. The stop at the bottom of this grade is BOGGAN'S OASIS, not Gorgan's. Great milkshakes!!! on October 21, 2009 0 out of 0 members found this review useful. A group of us rode this road June 2009, it was the number one rode that we rode on our trip in Washington State. Rode from North to South to Lake Wallowa. There is a great resturant at bottom of hill near Grande Ronde River at junction of DreamZ road. Biker friendly. Do not miss riding this road it is full of twistys and turns, enjoy it! Superb! A must for all riders.